Google loves wearables and this time it's getting even closer to your body with a developmental smart contact lens. Through miniaturized electronics, it can apparently measure the levels of glucose in your tears, offering diabetics an easier way to monitor their condition without the needles and the blood -- something we've reported on before. 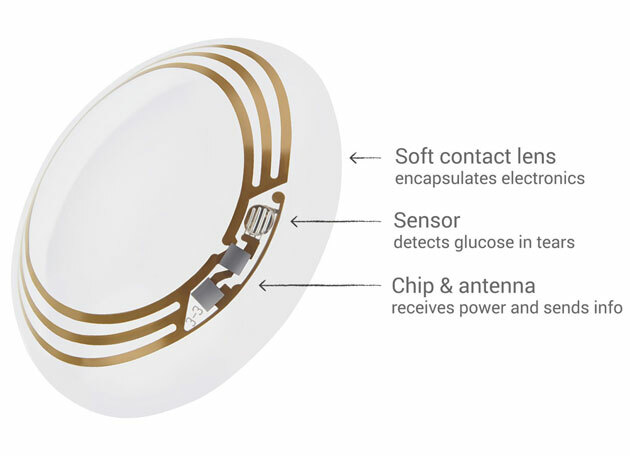 A tiny (really tiny) wireless chip and glucose sensor are wedged between two layers of "biocompatible" contact lens material, and Google is saying that it's already working on embedding tiny LED lights for notifications, too. There's been no shortage of developmental contact lens tech over the last few years, but the clout of Google means this could well be the most realistic mainstream offering, in addition to its very practical use cases. Google is currently angling for partners with more expertise in the medical market to help make it happen and is "in discussions with the FDA" to ensure the tech ticks all the right healthcare boxes before it progresses further. Recode's got a deep dive on the make-up of the smart contact: we've added their science textbook-grade diagram right after the break.